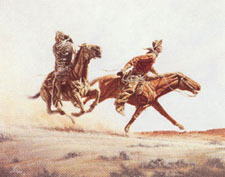 "STOLEN HORSES - BORROWED TIME"
Depicted in this painting are Butch Cassidy and the Sundance Kid, two of the most reckless and wild pardners to ever ride the outlaw trail. Their exploits of the late nineteenth century have filled many pages of Western history and have now become part of the rich folklore of the American West. Exclusive issue of only 500 signed and numbered artist's prints at $175.00 each. Image size 16" X 20". Please order online, E-mail or call us 307-868-2111.